As some Opposition members stood on their seats and others tried to push their way towards the Governor, SP legislator Subhas Pasi, who represents Saidpur constituency, fainted in the Well of the House. The UP Assembly’s Budget session began amid chaos Tuesday as the Opposition attacked the state and central governments on issues like “misuse” of CBI, stray cattle, farmer crises and unemployment, hurling paper balls as Governor Ram Naik addressed a joint sitting of both Houses. 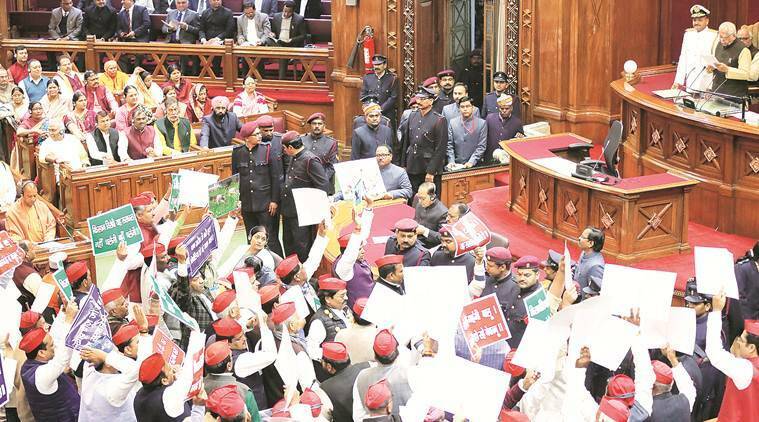 Wearing red and blue caps, newly-allied SP and BSP leaders put up a show of strength, shouting slogans like ‘Khet bachao sando se, desh bachao choron se’ and ‘CBI aur ED ka rajnaitikaran band karo’. They also held up placards portraying CBI as a dog being pulled from both sides and photographs of grazing cattle. Outside, they protested wielding giant cut-outs of bulls. As some Opposition members stood on their seats and others tried to push their way towards the Governor, SP legislator Subhas Pasi, who represents Saidpur constituency, fainted in the Well of the House. He was rushed to King George’s Medical University with high blood pressure. Trauma surgery department head Sandeep Tiwari said Pasi regained consciousness later, but will be undergoing an MRI to examine whether there had been any effect on his brain. In the House, the Governor made his speech amid constant hooting by SP and BSP members as marshals and security personnel used file covers to shield him from paper balls. He concluded by saying that with 14.40 crore voters, Uttar Pradesh occupies a key place in the country’s politics, and urged the people to ensure maximum voting. Naik further said that the aim of his government is to create a “crime and fear-free” atmosphere and “provide a new identity to our spiritual and cultural heritage”. He spoke about the Kumbh Mela having been organised in an “impeccable” manner and his government having “restored the cultural names” of Allahabad and Faizabad as Prayagraj and Ayodhya. Though Congress legislators also participated in the protests, they stayed in their seats raising farmer issues and unemployment. They also demanded action against those who “insulted” Mahatma Gandhi, referring to the Akhil Bharat Hindu Mahasabha recreating the assassination of the freedom fighter. “The Governor is the supreme institution in the government and should be respected by rising above party lines. If they are so indisciplined and aggressive inside Assembly, then they must be having a similar attitude in their public life,” he said after the House was adjourned. Leader of Opposition Ram Govind Chaudhary retorted that while SP leaders never forget decorum, they also know how to answer back. “SP people are followers of Gandhi, Lohia and Acharya Narendra Dev…We never make personal attacks on them. While it is said that a thief can identify a thief better, it appears that the CM has a better understanding of a gunda (goon),” he said.